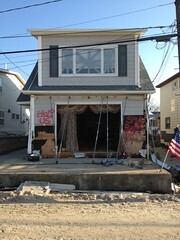 East Villagers continue to band together to help bring relief to the storm-battered Rockaways, where thousands are still without power or heat. 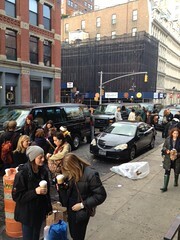 On the Sunday after Hurricane Sandy struck, Emmett Shine – founder of Gin Lane Media, a Bowery-based branding and design company – and James Cruickshank, his partner in Lola and an owner of Whitmans restaurant on East Fifth Street, poured into a 15-seat passenger van with 14 other people and headed out to the ravaged peninsula. They ended up at the Rockaway Beach Surf Club at Beach 87th Street, where Lava Girl Surf was leading a community relief effort. “We were so impressed that this whole grassroots organization had flourished at this beach club,” said Rebecca Zhou, 22, a strategist at Gin Lane. The group broke into teams of five and began distributing donated items. “That day people in our group cleaned out flooded basements and helped people clear out moldy, wet furniture,” said Ms. Zhou, who went door-to-door, checking on the elderly residents of a high-rise apartment complex. There was clearly a lot to be done. “People said they felt like they were forgotten by the city,” said Naomi Baria, director of strategy at Gin Lane, who climbed 12 flights of stairs to deliver water to an elderly woman who hadn’t spoken to anyone in four days. Serendipitously, friends who owned Bond Street restaurant The Smile had thrown a party the previous Saturday, collecting $3,500 at the door. That amount ended up funding seven vans that delivered just over 400 volunteers. “Originally we were going to write a check to one of the large relief organizations,” said Matt Kliegman, 29, an owner of the Smile. But after talking to his friends, he concluded that the best use of the money would be to get volunteers to the Rockaways. Matt Kliegman Volunteers and vans outside of The Smile. Mr. Shine reached out to other friends and clients — including Saturdays Surf, Cantora Records and Raise Cache — who helped find drivers and get the word out to volunteers. Web designers at Gin Lane quickly created the Rockaway Relief site, which went live Wednesday, with a link to an Eventbrite sign-up page. “Within five hours we had sold 300 tickets. At the end of the day we sold out completely, which was 425 spots total,” said Ms. Zhou, adding that another 350-or-so people were put on a waitlist. The cost for volunteers was $5 per person: a token amount, Ms. Zhou said, to ensure that people who signed up would show. It also allowed the group to buy shovels, masks, gloves, garbage bags and other supplies for the volunteers. To that end Rogan, in collaboration with the non-profit Waves for Water, is collecting blankets at its store at 330 Bowery. From noon to 8 p.m. daily (except Sunday, when donations are only accepted until 7 p.m.) one can drop off new and used blankets in good condition. Donations requests change according to needs, so check here for updates. Another relief effort, Bring Back the Boardwalks, is, in part, locally based: the fundraiser, taking place Friday at Trais Gallery at 76 Wooster Street, was co-organized by Dave Ortiz of Dave’s Wear House, a Baxter Street apparel shop. A silent auction will feature the art of downtown artists like Kenzo Minami. Also on Friday, Flutura Bardhi, a.k.a “Insidia,” the keyboardist for the burlesque rock band Roma! 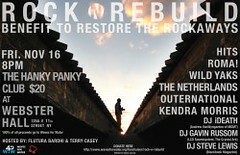 will throw a benefit concert at the Hanky Panky Club at Webster Hall, with all proceeds going toward Rockaway relief, via Waves for Water. The diverse lineup also includes soul singer Kendra Morris, electro-rock-synth band The Netherlands, political punk-rock band !Outernational!, and DJs from the bands MGMT and LCD Soundsystem. Tickets, $20, are available at the door only. Those who can’t make it to the show can also donate to the ongoing fundraising project here. Ms. Bardhi said she was inspired by the amount of grassroots organizing that has taken place in the Rockaways. At first there was nothing set up, she said, but now the number of volunteers has increased five-fold and there are multiple drop-off centers and hubs. “In the beginning, I was literally going there with donations that my friends and I bought and just went looking for people to help,” she said. Since then, she has worked out of the beach club and the Occupy Sandy base, taking supplies dropped off at Sunset Park to the beach. “But there’s so much more to be done,” she said. On Saturday, local artist Nicolina Johnson and the Free Art Society — of the Mad Hatter Tea Party — are helping to organize a Rockaway Kids Carnival. Performers and artists like the Hungry March Band and Olek will entertain kids who’ve spent the past two weeks “sad, frightened, and just plain bored,” per the Facebook page. Sign up to volunteer here.